Have you ever had Chinese food in a restaurant and though, "Wow, I would sure love to know how to make this at home." Well, wonder no more. 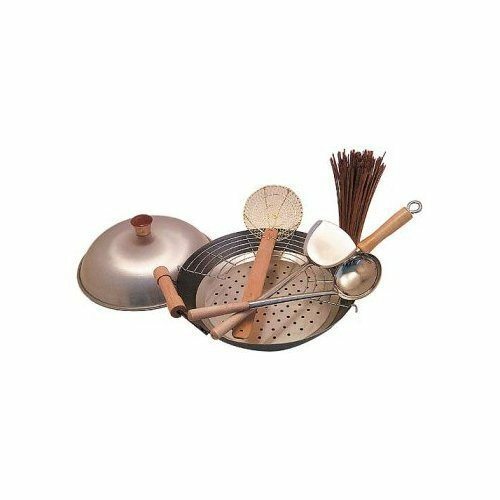 With these incredible carbon steel woks, you can make your favorite Asian dishes within the comfort of your own home. However, if you're a beginner and don't know where to start, fear not. 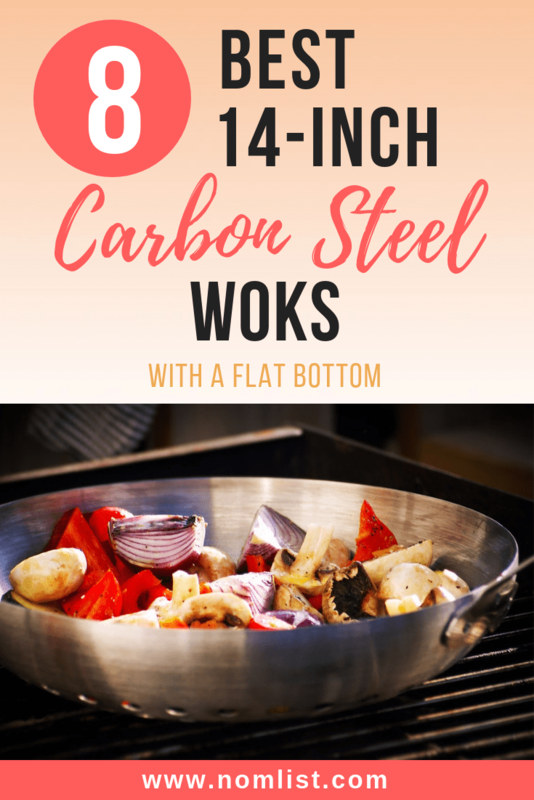 We did the homework for you and found the best 14 inch carbon steel woks with a flat bottom on the market just for you! When it comes to choosing a wok, there are a couple of options. Flat bottom woks work well in conventional kitchens. 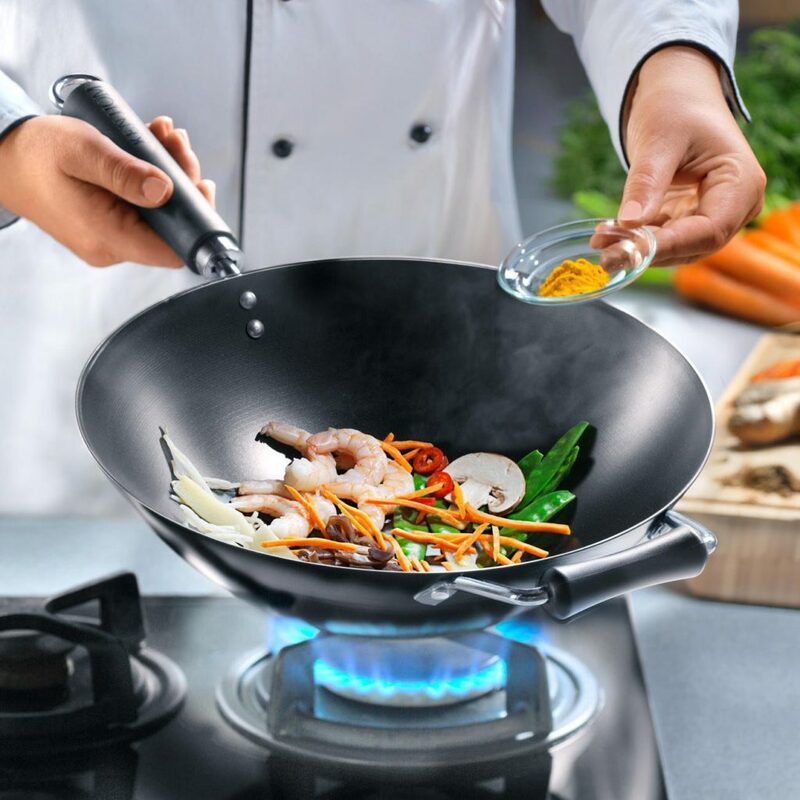 Since most kitchens cannot accommodate open flame gas ranges stove tops or outdoor wok burners, flat bottom woks allow you to cook your favorite Asian cuisines on a Western electric range cooker without the use of a wok ring. However, the only caveat is that electric range cookers tend to not get as hot as open flame gas range stoves. So, be sure to check what recipes you are cooking and make sure they don't require high heats for cooking. Woks can come in many different shapes, sizes, and materials. Some are made from stainless steel, aluminum, and cast iron. However, the most commonly used and worn by professionals is carbon steel. Carbon steel is extremely sturdy yet very light in weight making it easy to move about when cooking. Plus, it is easy to clean and season and doesn't deteriorate or oxidize like other metals. Also, carbon steel is a very effective conductor, meaning it heats up very quickly and stays hot while cooking. Fill wok 2/3 full of water. Place on stove and boil water for 8-10 minutes. Pour out water and run under cold water. Using a strong scrub pad, scrub vigorously to remove the factory protective coat. After you finish these steps, you are ready to season your wok! 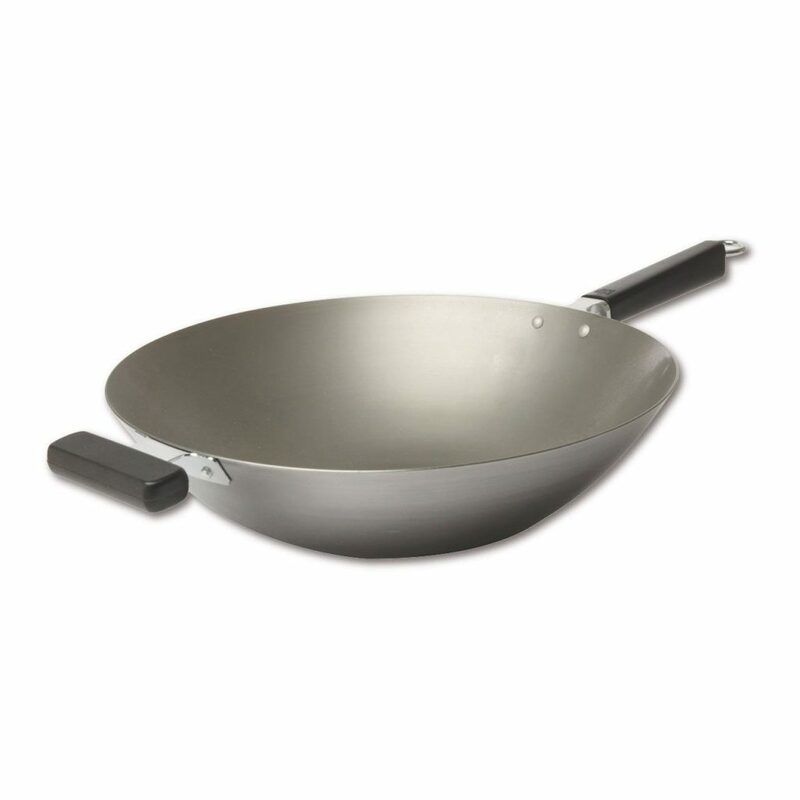 Joyce Chen's Pro Chef Flat Bottom Wok is our #1 pick for the best 14 inch wok. It's made of uncoated, heavy gauge Carbon steel and is optimally designed for gas or electric heat sources. It features an ergonomic Phenolic handle which is heat resistant and fits comfortably in your hand. This wok needs to be seasoned before using and is hand wash only. Joyce Chen is the designer of this wok and she is a pro chef who successfully opened her first restaurant in 1958. At the time, she couldn't find Chinese cookware in the US fitting to her standards so she created her own line. This is a sturdy, high quality wok weighing in at 5.1 pounds. It's made in China and the handles can withstand up to 350 degrees in heat. The handles are conveniently removable so that you can use the wok in the oven if needed. This wok is 2mm thick which is a solid, thick metal which produces greater heat distribution than woks of a lesser thickness. The bottom of the wok measures approximately 6.5 inches. We love this wok! It's got a solid heft so that it doesn't move around on the stovetop. It's our #1 pick for the best 14 inch carbon steel wok! It's Joyce Chen yet again, she's definitely owning the 14 inch Carbon steel wok game! 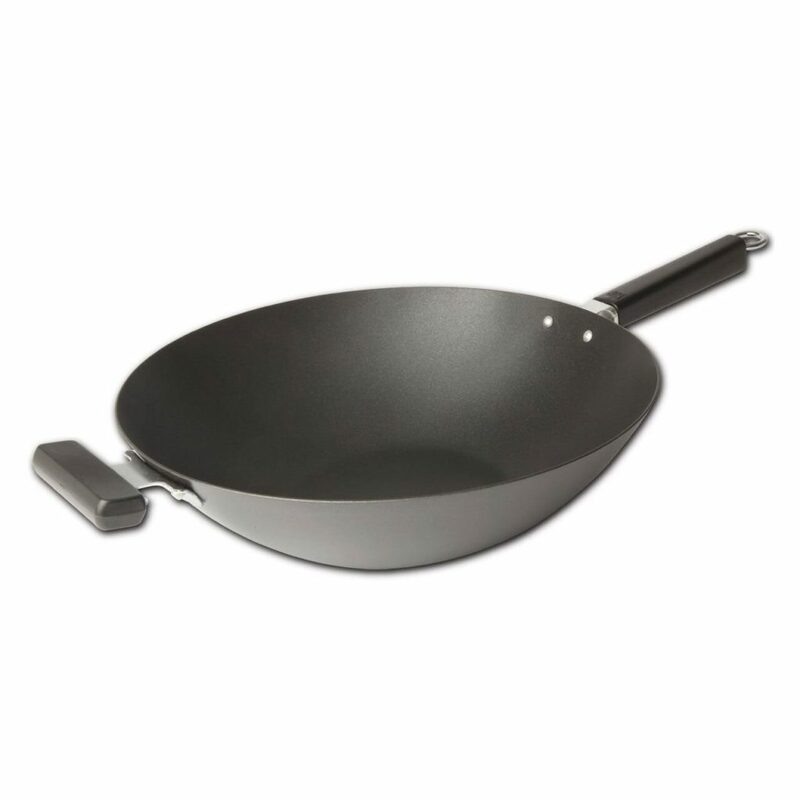 This next wok is from her Classic Series and it features a 1.5mm Natural Carbon steel. The main handle and the helper handle are both made from high quality birch wood.The diameter of this wok is 6 inches and it measures 3.4 pounds. Joyce Chen's woks are made in China. The smooth interior of this wok will need to be seasoned before its first use and after that it will heat fast and give you an even, dependable heat. This same wok is also available with a round bottom or as part of a four piece set. The bottom of the pan measures about 7 inches. We love the sturdy and elegant looking birch handles and they are easy to handle during cookings. The sides are ridged which is ideal for Chinese stir-fries because the food will cling to the side and leave you room to cook your next ingredient. Whats great about this is that the food placed on the sides will continue to cook evenly and at a lower heat. 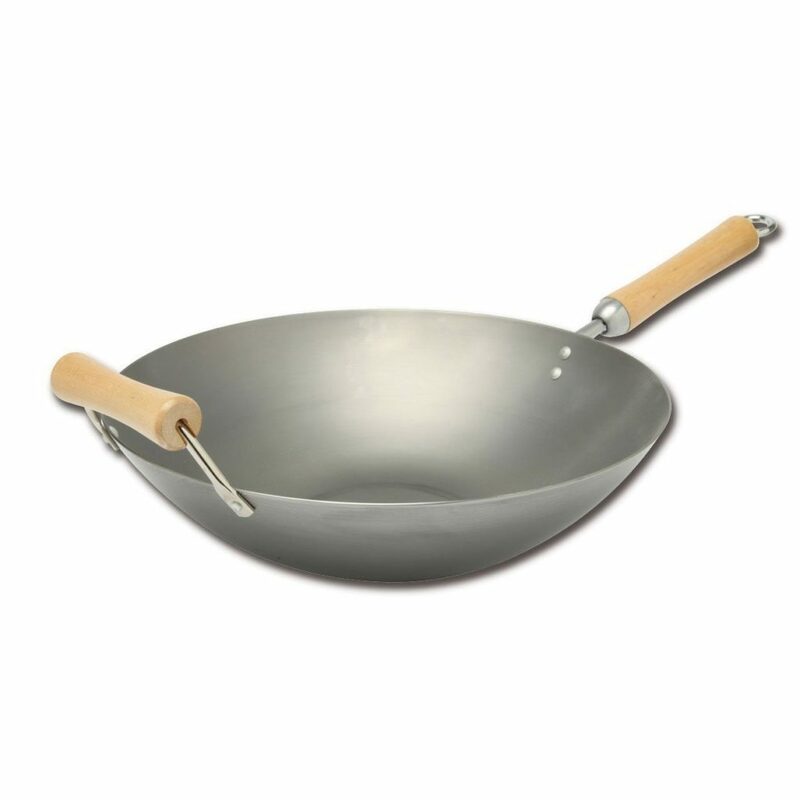 If you are looking for a carbon steel wok with a thin steel (1.5mm) pick up this Classic Series wok from Joyce Chen! Hey it's another 'Chen' with a quality wok on the market, this time instead of Joyce Chen, this wok is designed by Helen Chen. this is a well priced carbon steel wok and I love that it comes as a set. What's included is the 14 inch wok, a metal lid and a 13 inches bamboo spatula. No more messing around with pan covers that don't fit your wok, this domed lid will fit your wok perfectly! It's also available without the lid if you prefer, and in a 12 inch version and a non-stick version. 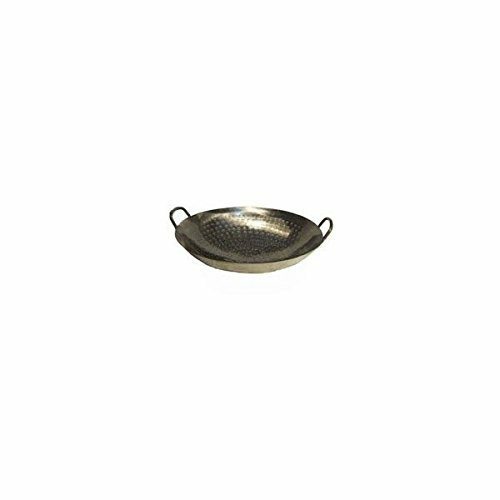 This wok is produced from a 1.6 mm carbon steel, conducts heat quickly and is not overly heavy. 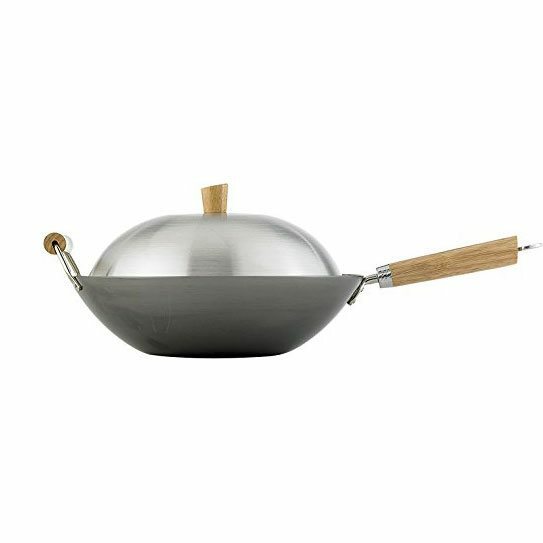 The wok features wood accented handles. I love that even the lid has a piece of wood on top. No more burning my hands when lifting the lid! Helen Chen is an accomplished cookbook author and teacher and she wanted to create the ideal line for home cooks. This wok features concentric grooves in the metal which create an even and fast heat. If you give this wok tender loving care, it should last a lifetime! If you are looking for a carbon steel wok that is not too heavy or light, this ones just right! Wok Shop's wok is made in the US of A and if created from a 14 gauge carbon steel. This wok is heavy and sturdy and its a boss! There's a wooden side handle to give you extra control when stirfrying. The metal is unseasoned and heats rapidly and evenly You must take care of this quality wok, make sure to dry immediately after using, which is easy to do because the metal cools rapidly after cooking. This wok is hand wash only! It features a wooden handle and it works great on a gas stove and electric stove alike. Remember that if you are cooking with gas you are going to want a round bottom wok instead.This wok weighs 7.5 pounds and measures 13 x 10.5 x 6 inches. It's 4 inches deep and it holds a good amount of food, feeding generous portions for 4 people. The short handle cannot be removed so if you are seasoning the wok in the oven, you can wrap the handle with a wet towel and cover the wood with foil. You can unscrew the main handle.This wok produces a great high heat for the ultimate quality in Asian and especially Chinese cooking. M.V. Trading’s Wok is made in the USA and features two steel handles. This is the original wok design and wood and plastic handles were only added in recent years for cooking convenience. This wok is made from 14 gauge steel which means that it is heavy duty and sturdy as hell. 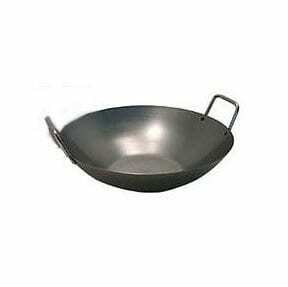 This wok is also available in 12 inch and 16 inch versions. It measures about 4 inches in depth and also has a lid that you can purchase separately. The diameter of M.V. Trading's wok is 4 inches with the flat portion being about 6 inches and its also induction friendly. This wok is induction friendly. Make sure to follow the included instructions carefully or else you may have a metallic aftertaste to your food. Before using you have to first stir fry with the wok using pungent vegetables such as onion or garlic until charred. Wipe it clean and you're good to go! This is a wok that is designed to last a lifetime as long as you treat it right. Season this wok right at the beginning and you'll reap the benefits of super delicious stir fry foods for years to come. This wok also comes with a handy lid that helps cooking time on your food go quicker. The helper handles also alleviate stress on one hand when flipping larger amounts of food. This set is perfect for someone who wants to get their feet wet in Asian cooking and needs an all-in-one package! Next up we have another wok from Asian cooking master Joyce Chen. The difference is that this carbon steel wok is coated so you don't have to worry about food sticking. 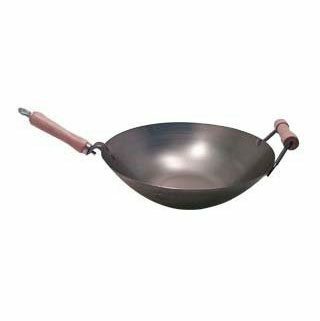 This wok is made of 2.0 mm carbon steel, which means that it is professional grade. The non-stick coating is Excalibur reinforced and can withstand stir frying when using most metal tools. The Phenolic handle is designed to stay cool. 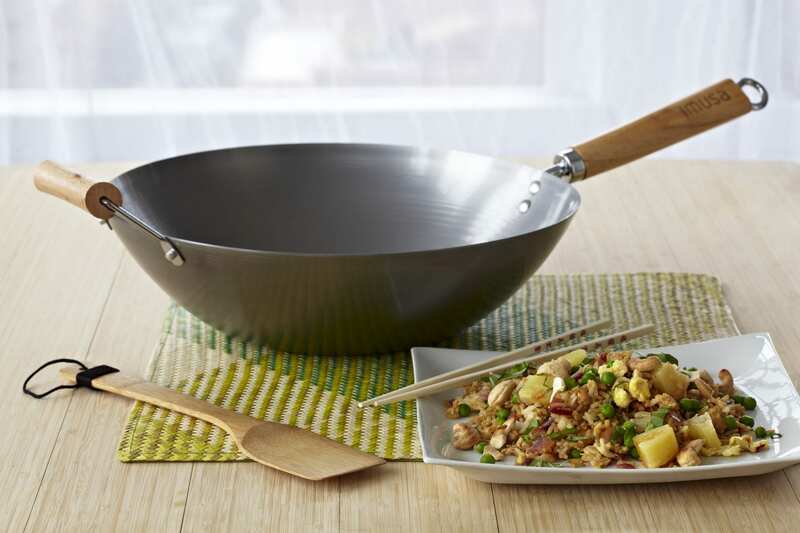 This wok's non-stick coating has a 25 year warranty so you can trust it to last you a lifetime. This is a very heavy duty, serious wok, its a total boss! It will work on an induction cooktop. The capacity of this wok is about one gallon and it weighs 4.5 pounds. Now if you want to be absolutely legit, you'll want to use a non-stick carbon steel wok. However, when cooking at home you just don't always need professional grade food and sometimes you just want to bypass the inconvenience of seasoning the wok and non-stick rocks too. The texture inside is rough so you won't be able to use a paper towel to clean the inside, you'll want to use a regular towel. Since its non-stick, you can use less oil and its a bit healthier cooking overall! It's a showdown between Joyce Chen and The Wok Shop, who's going to win with the most featured woks on this list?! This next wok from The Wok Shop is unique because it has been hammered and features dimples in the metal. Also, not to worry, although they only provided a round bottom wok for their sample photo, the wok is indeed flat bottomed. This wok is super easy to season and it features two heavy duty metal handles in the traditional wok style. This wok is hand hammered and made in the Guangdong Province of China. Its a showpiece that will last you a lifetime! ​This wok is built to last and also built extremely durable for the more intense kitchen ventures you decide you endeavor. The two metal handles make it easy to handle larger loads of food and work well for transporting food from the stove to a work space. Also, this carbon steel wok is very easy to season! Thank you so much for the information! I just purchased a small carbon steel wok , the first ever, and am amazed at how wonderful it is to cook in. All the posts are helpful. So glad we could help with your purchase! Keep us posted on some of the delicious recipes you’ve made!